Jabari Blash hit his Mariners farm system leading 22nd home run last night. 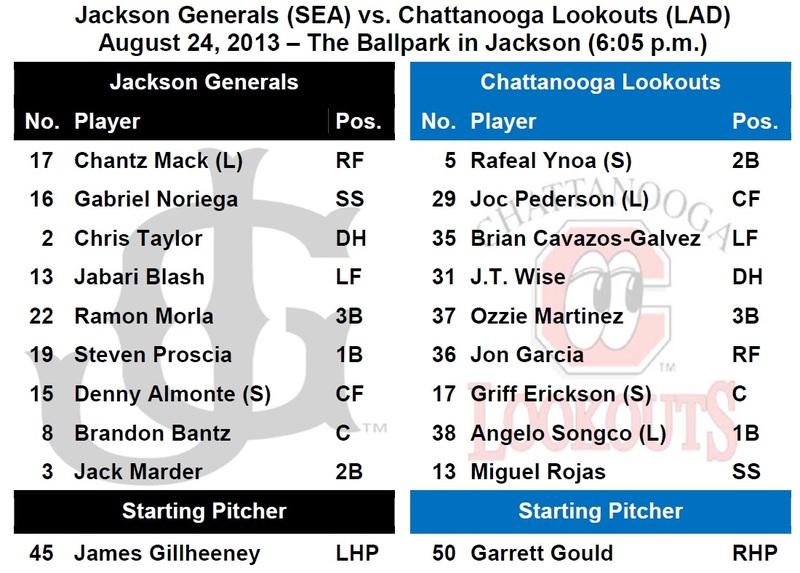 TODAY’S GAME: the Generals continue their final homestand of the season tonight with game #2 of a 5-game series with the Chattanooga Lookouts (0-1)…this season Jackson is 8-8 against the Lookouts and 2-4 at The Ballpark in Jackson…the Generals have dropped 6 straight games which is a season low…Jackson will wrap up the season with a 5-game series at Huntsville starting next Thursday. GENERALS RECAP: The Generals held a 2-1 lead before allowing a run in the top of the 8th and another in the 10th as Jackson lost to Chattanooge 3-2 on Friday night. 3B Ramon Morla (3×5, 2 2B, RBI) led the team with 3 hits, while LF Jabari Blash (2×2, 2 R, HR, RBI, 3 BB) recorded the team’s only other multi-hit game. Starter Moises Hernandez (5.0,2,1,1,0,3,HR) made his 2nd start of the season, allowing 1 run on 2 hits in a 5.0 inning no decision. RH Stephen Kohlscheen (2.0,1,0,0,1,3), LH Nick Hill (0.2,2,1,1,1,0), RH Dominic Leone (1.1,1,0,0,0,2) and RH Stephen Shackleford (1.0,2,1,1,1,1) combined to allow 2 runs over 5.0 innings in relief. Shackleford recorded his 2nd loss after allowing a run in the top of the 10th inning. NEWS & NOTES: 45 of 126 games have been 1-run games (18-27) which is the 6th in all of minors…64 of 126 games have been decided by 2-or-fewer runs (23-40) and 17 have been extra-inning games (5-12)…In games decided by 3+ runs the Generals are 32-26. • OFF WITH A BLASH: OF Jabari Blash has hit safely in each of his last 7 games, batting .450 (9×20) with 4 runs scored, 2 doubles, 1 home run, 5 RBI and 9 walks. He has a hit in 15 of his first 20 Double-A games batting .319 (22×69) with 6 of his 21 hits being home runs. Blash belted a homer in his first Jackson at-bat on August 2 at Mobile…hit 2 home runs vs. Montgomery on August 15. He leads the Mariners farm system with 22 HR. • TAYLOR HAVING A GREAT AUGUST: INF Chris Taylor is batting .341 (31×91) with 16 runs scored, 4 doubles, 1 triple, 6 RBI, 12 walks and 7 stolen bases in 24 games in August. • WE GOTCHA!! Jackson catchers lead the SL catching 51.6% of base stealers (64 CS, 124 Att). The next closest is Pensacola which is throwing out 35.1% of base stealers. • SEATTLE GENERALS:...there are currently (8) players on the Seattle Mariners roster that were a member of the 2012 Jackson Generals (RHP Carter Capps, RHP Brandon Maurer, INF Nick Franklin, INF Brad Miller C Jesus Sucre (15-day DL), C Mike Zunino (15-day DL) RHP Yoervis Medina and RHP Stephen Pryor (60-day DL). In total, (9) 2012 Generals have made their MLB debuts and (4) 2013 Generals. (C Brandon Bantz, RHP Hector Noesi, INF Brad Miller, RHP Erasmo Ramirez).